Blaine O’Leary, self advocate and member of the Ohio Developmental Disabilities Council, back row far right, is pictured with Steve Beha with Arc of Ohio, back row far left, Scott Phillips, center, Connie McLaughlin, bottom left, both with the Ohio Department of Developmental Disabilities, and Blaine’s stepmother, Betsy O’Leary, bottom right, who comprised a panel representing Ohio, prior to their presentation at the 2018 Reinventing Quality conference for the equality and diversity of people with disabilities in Baltimore in July. 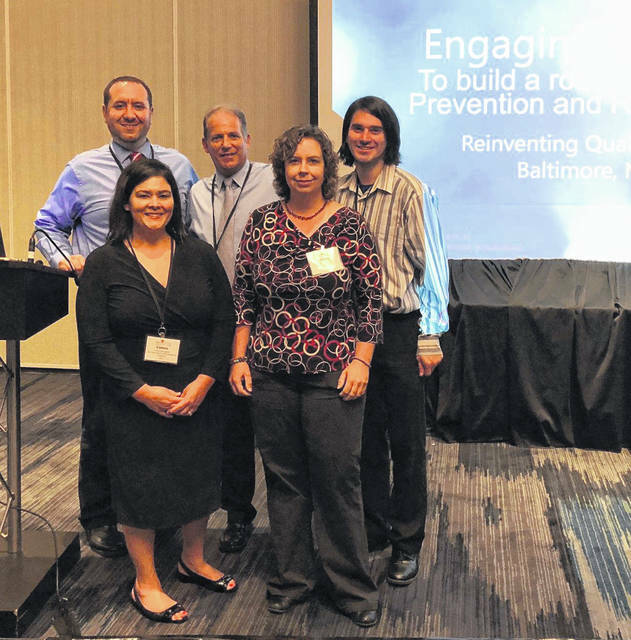 SIDNEY — Blaine O’Leary, of Sidney, recently represented Ohio as one of a five-person panel at the 2018 Reinventing Quality conference for the equality and diversity of people with disabilities in Baltimore. The subject of the July conference was Building an Infrastructure that Promotes Equality and Diversity. O’Leary, who was selected by Gov. John Kasich to sit on the Ohio Developmental Disabilities Council in 2015, jointly presented Ohio’s plan of Creating and Managing a Culture of Quality: Engaging Stakeholders to Build a Robust Critical Incident Prevention and Response System. Other members of the panel who presented the topic included Scott Phillips and Connie McLaughlin both with the Ohio Department of Developmental Disabilities, Steve Beha with Arc of Ohio and Blaine’s stepmother Betsy O’Leary. The Ohio Developmental Disabilities Council is one of a national network of state councils that is committed to self-determination and community inclusion for people with developmental disabilities. “It was completely an honor. I‘m representing the state of Ohio, but not only the state of Ohio, but I can be an inspiration to other states to come up with other ways to ensure other people (with disablities) in other states have less reports and prevent (negative incidents) from happening,” Blaine O’Leary said. O’Leary, a 2013 Fairlawn High School and Upper Valley Career Center graduate, is a self-advocate, meaning someone with developmental disabilities, who presented as a stakeholder of personal experience. But he also works for the Shelby County Board of Developmental Disabilities as an advocacy specialist. He supports other individuals who receive services and has received training at the state level in regards to advocacy. The panel’s 45 minute presentation was given to approximately 70 people from various agencies across the country, O’Leary said. It was one of numerous other sessions scheduled between July 30 and 31. “If you don’t have individuals’ feedback from family going through it, you can’t make decisions,” Phillips continued about how the Ohio Department of Developmental Disabilities determine its system of prevention and protection. Earlier this year in April, O’Leary also represented Ohio on behalf of the Ohio Developmental Disabilities Council as one of a 30-member state delegation to the Disability Policy Seminar in Washington, D.C. The April policy seminar gave participants the chance to discuss key issues with each other and with their representatives on Capitol Hill. O’Leary’s advocacy continues as the chairman of the Employment Committee of the Ohio Developmental Disabilities Council. He also sits on its Assistive Technology and Communications, Community Living and Public Policy committees. O’Leary has volunteered for Raise the Roof, the YMCA, Special Olympics, Relay for Life and the Shelby County Historical Society. In Sidney, O’Leary is employed by the Spot restaurant.